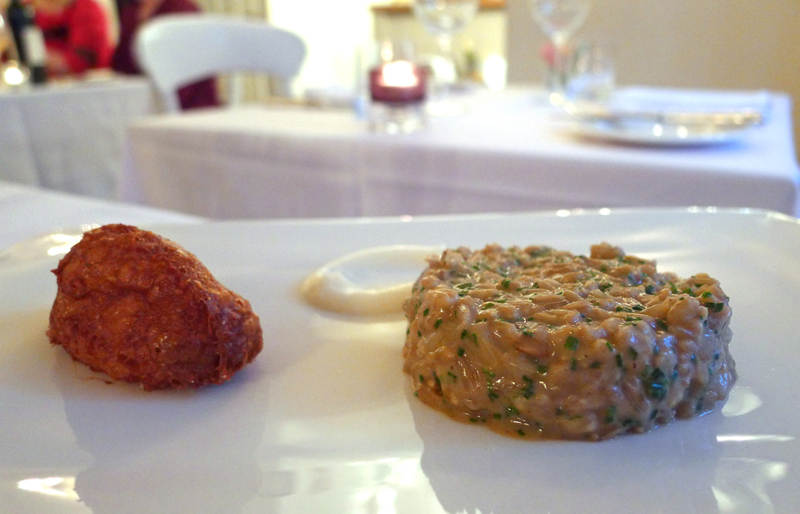 Aumbry , Manchester and Mary Ellens Tasting menu. My nutty friend Franco ( sausagemaking man ) and the even nuttier Hungry Hoss have been chattering on about their favourite Northern restaurant Aumbry for many months now but i`ve always been busy on their suggested dates so our meet up was never set.Finally an opportunity came up whilst i was in between jobs so i headed off from a very very wet West Cumbria to an even wetter Bury , Manchester, two and a half hours down the M6.I didn`t even have time to unpack my overnight bag before Franco started to load me up on his home cured ham and Parmesan straight off the plane from Italy only hours before…washed down with red wine and then straight to the local pub for more…..Ohhhh dear , alcohol overkill from the outset. There`s a lot been written recently about Aumbry so i`m not going to parp on about it again.Hungry Hoss is somewhat of an Aumbry expert so check his posts out.In a nutshell we opted for the biggie…The Tasting menu cooked by Mary Ellen McTague and probably the best way to see what the food was all about. 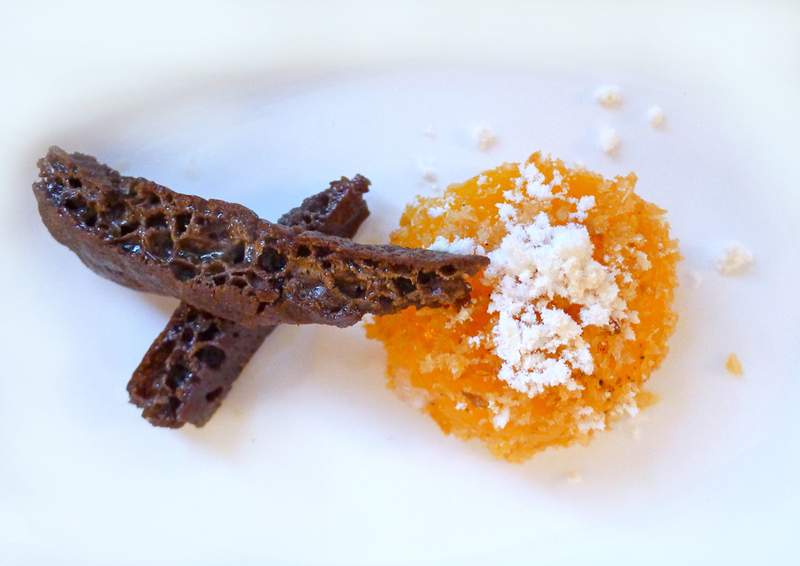 Mary spent 4 years working for Heston Blumenthal at the Fat duck so there`s a great reason to eat at Aumbry for a start. Pair that up with Mary`s kitchen skills earning her best Northern chef 2011 and we had to be on to a winner….and so it began. 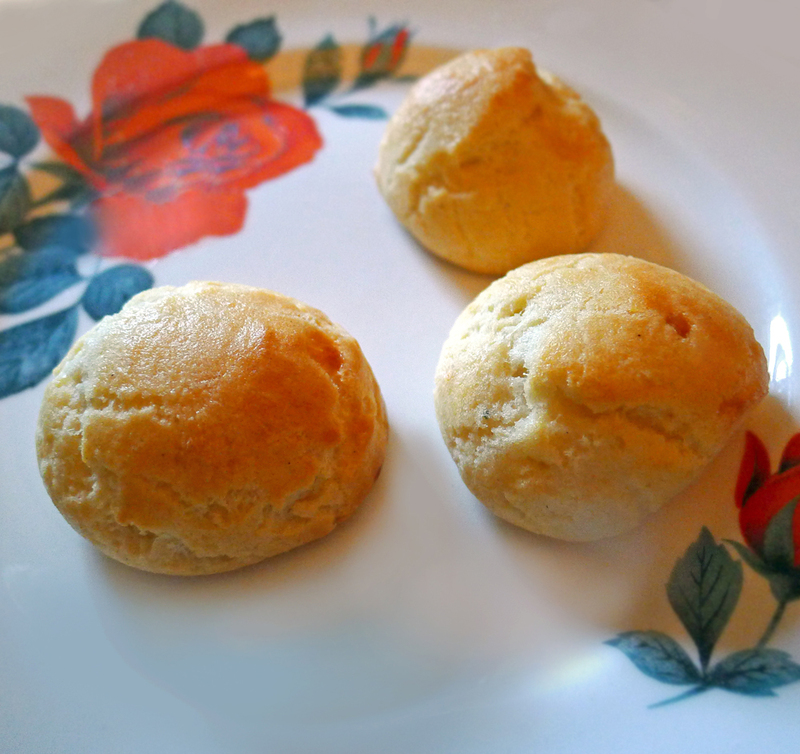 Cheese Gougeres as little nibbles whilst we took in the Aumbry menu upstairs. 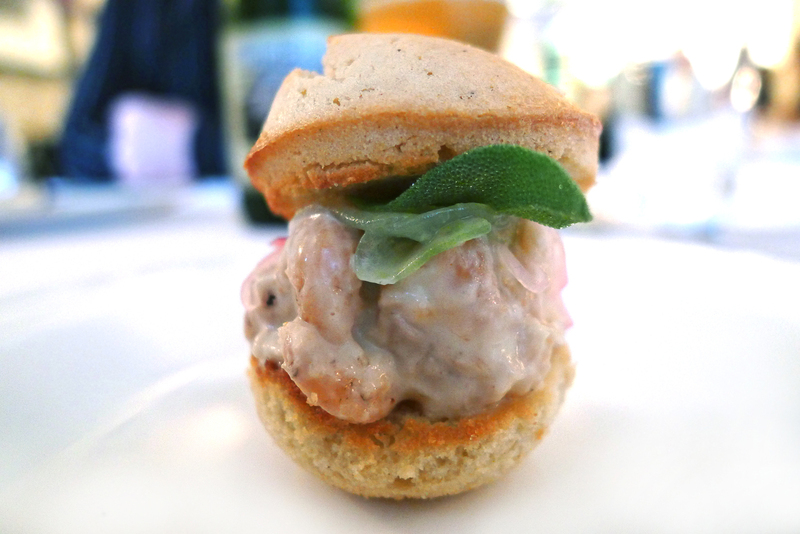 More nibbles in the form of a mini Aumbry Prawn burger. The most amazing bread dipping exercise a diner will ever encounter , hot Beef dripping and a very rich Beef juice , not the healthiest dip around but a definite meal highlight and totally unique….great Northern comfort. 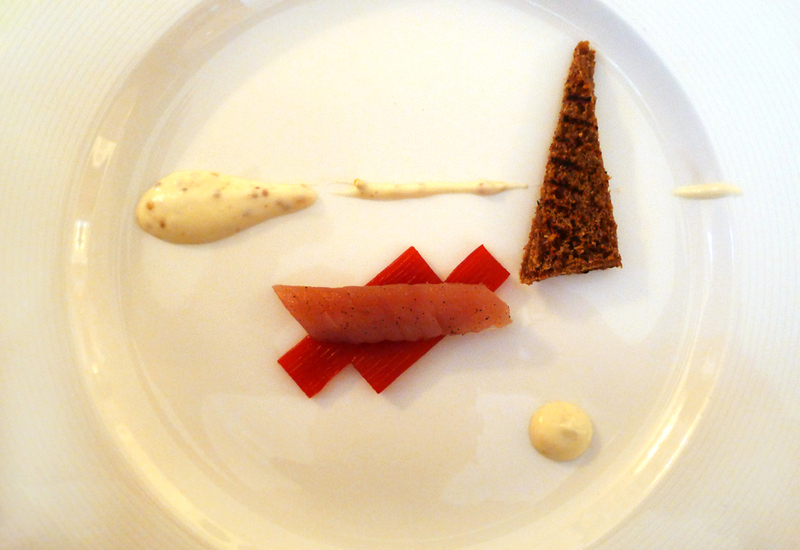 Home smoked Mackerel , poached Rhubarb and mustard cream. 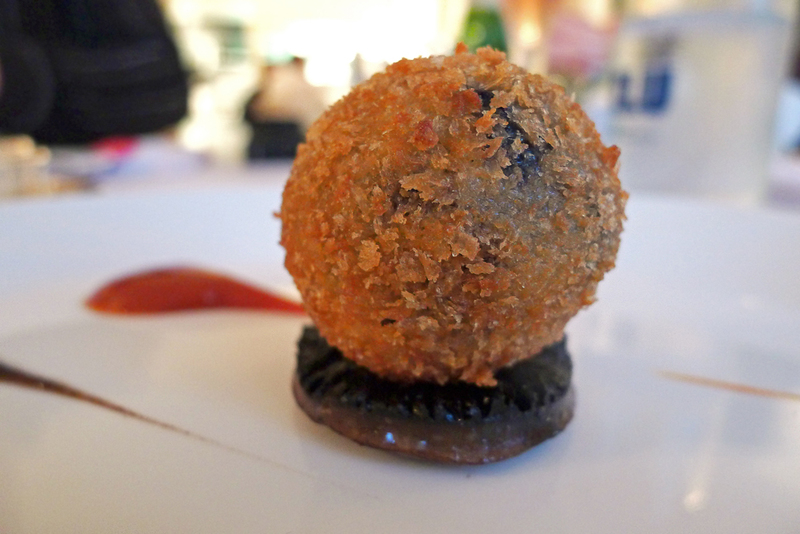 Bury Black pudding Scotch egg , Tomato ketchup and Mushroom relish. – A mini breakfast on a plate , nothing groundbreaking here but good use of local ingredients accurately cooked and full of flavour to the max….i could do a dozen of these every morning if i`m honest…very comforting. 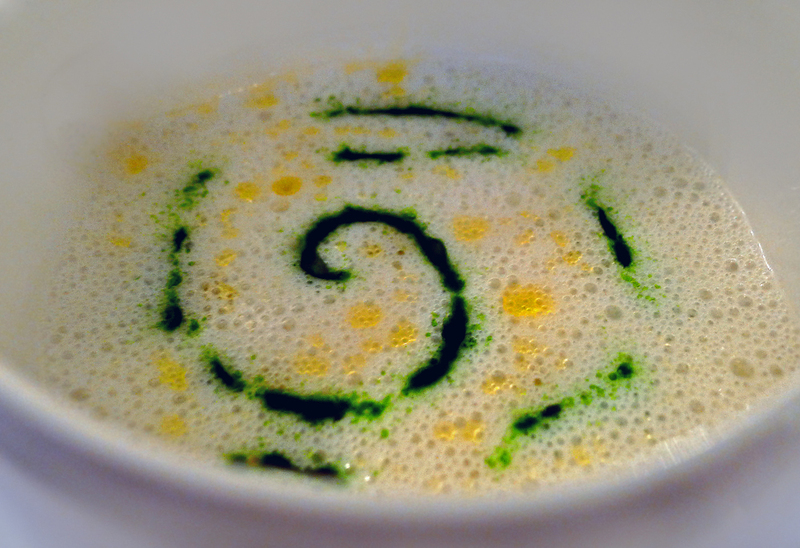 Potato and wild garlic soup with English truffle oil. Cauliflower and Oat groat Porage , seared Grelots and Cauliflower beignet. Well it was certainly different , an unusual play on textures with the Porage.Personally i think it could be improved 100% with the addition of a skewer of seared chicken hearts / juices or something similar to add a meaty richness to the dish. 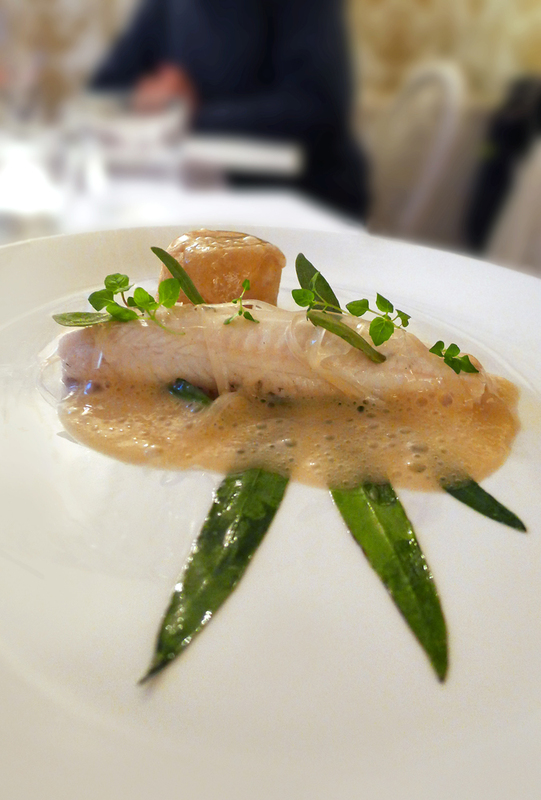 Poached Plaice , Oyster pudding , sea aster, peppermint , verjus and sea purslaine. Now here we have the dish of the night , barely cooked fillet of Plaice with tastes of the sea…..wow.Now as ive already mentioned , I dont like Oysters in any shape of form…but encased inside this mini Oyster pudding they were world class.This one or a variation of it has to be Mary Ellens staple on the menu. I would never take it off….wonderful. I`ll be back for this again…..guaranteed. Slow cooked cumbrian lamb (braised shoulder & chargrilled fillet) with langdon community spring onions, white onion puree, roasting juices. 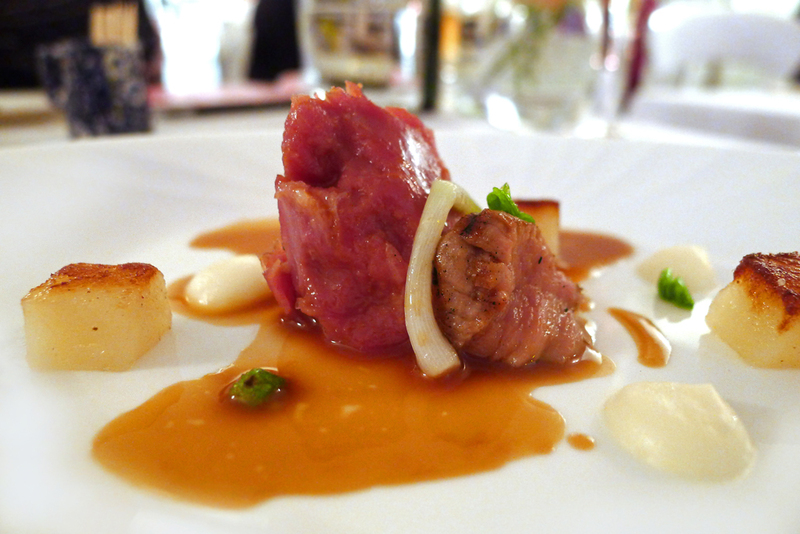 This i feel was the weakest dish of the menu , there was lots of flavour but i had to ask the guys i was dining with what the meat was.I honestly couldn`t decide if it was Ham , Pork or Lamb. Saying that , it was packed full of flavour but i didnt take to it. 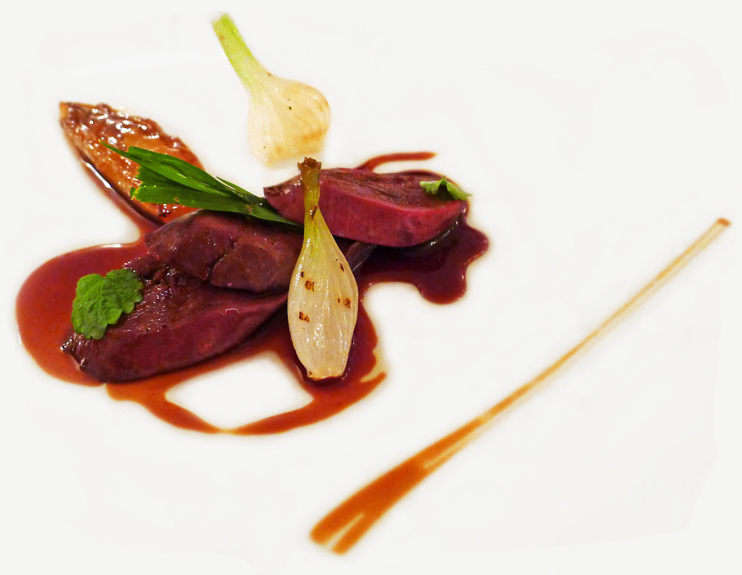 Cumbrian wood Pigeon , grilled Grelot , braised chicory , Lemon balm and Barley grass. Rich , gamey , cooked to perfection , wild wood pigeon at its best.Not the most tender of meats but it was a wild bird and had spent all day flying through Cumbrian woodlands so what it lacked in tenderness it made up with flavour… simple and beautiful. 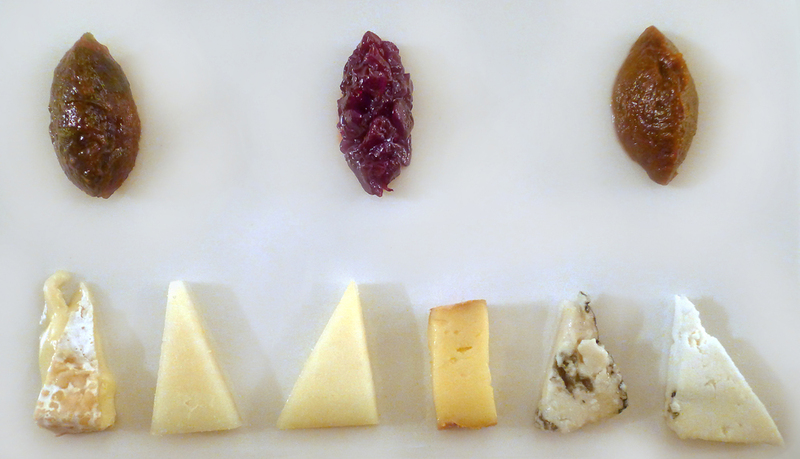 Selection of British and Irish cheeses. 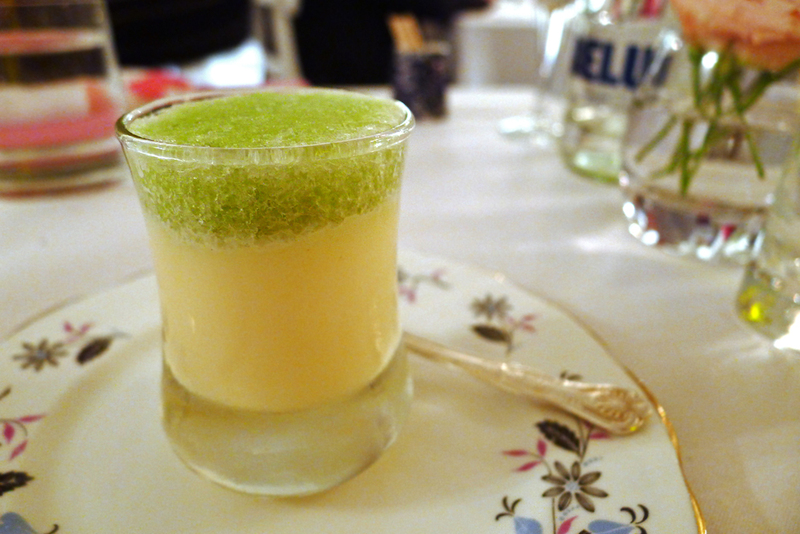 Grapefruit possett , Celery granita & Sherbet. 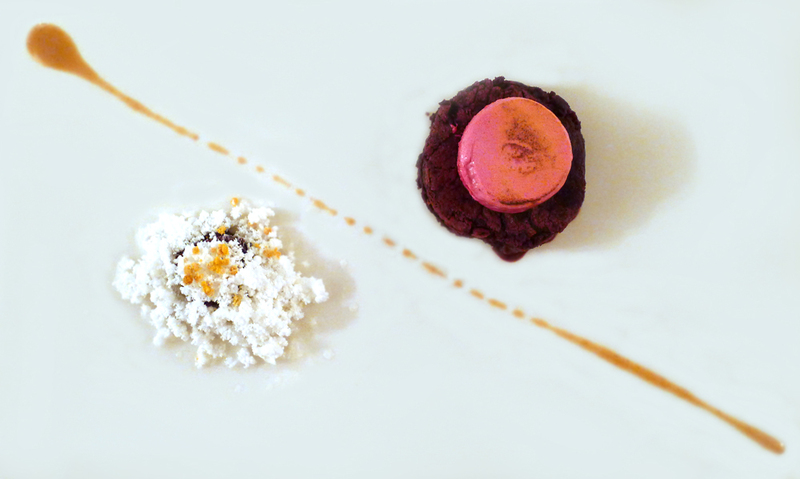 Beetroot & chocolate cake with beetroot marshmallow, caraway, hazelnut, heaton park honey & bee pollen Different….in a nice kinda way. Rich chocolate cake scented with what i thought was Dill ( i wasn`t far away with Caraway ) and a soft gooey marshmallow topping.I think the white powder was Hazelnut ice A very sweet dessert but it suited a sweet addict very well. 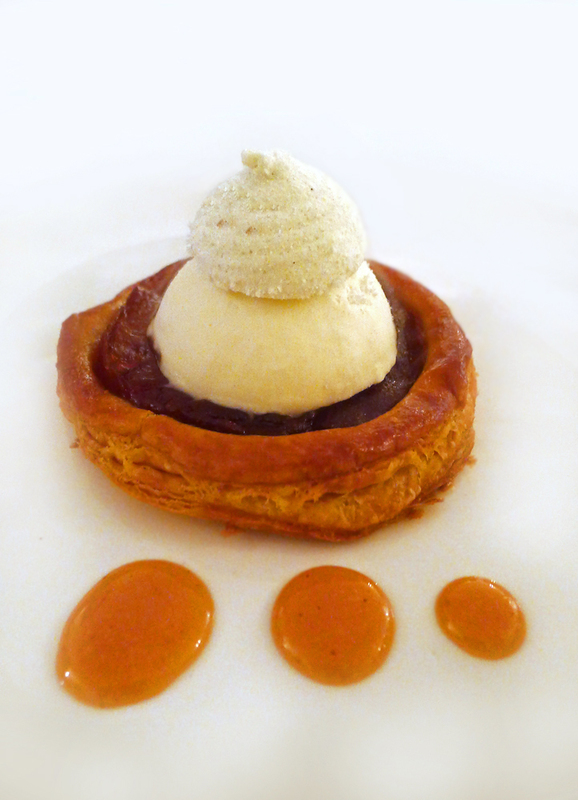 Apple tart , Heaton park honey , yoghurt , bay and almond. Just a simple caramelised Apple pie , well baked and had the tell tale signs of Liquid Nitro poaching with vapours rolling off and down on to the table….. Nice. 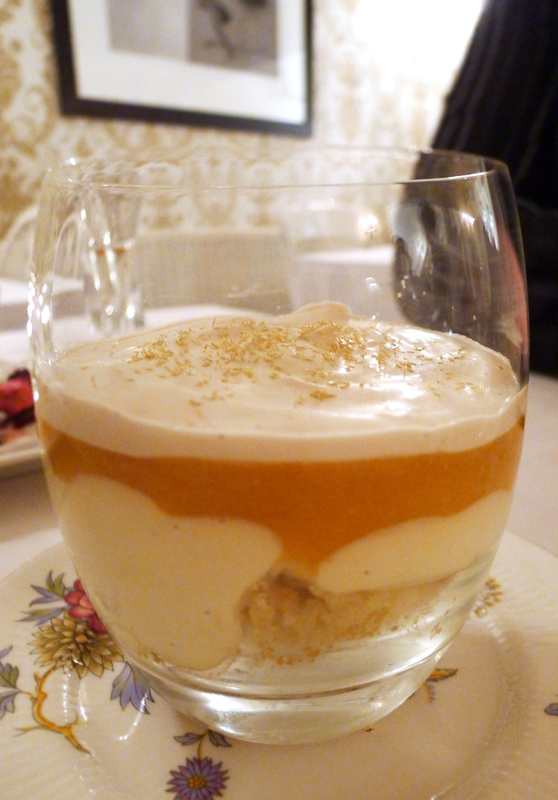 Aumbry Trifle consisting of an almond sponge base soaked in Colosia Moscatel with Chamomile custard, apricot jelly and moscatel syllabub. This was a Mary Ellen pudding in production so of course we would have to be the human guinea pigs….More sweetness to satisfy cravings. At the end of the evening , Restaurant Ambry up in lights I think that we all owe Mary Ellen and her team a visit here , it`s not going to break the bank , its romantic , the foods great , the beer is unique and amazing ( someone remind me what we were drinking please ). There`s tweaks that i personally feel need to be made in order to carry on climbing the ladder but that`s purely my own opinions , i`m no expert. The service was great , full of smiles and friendly conversation. 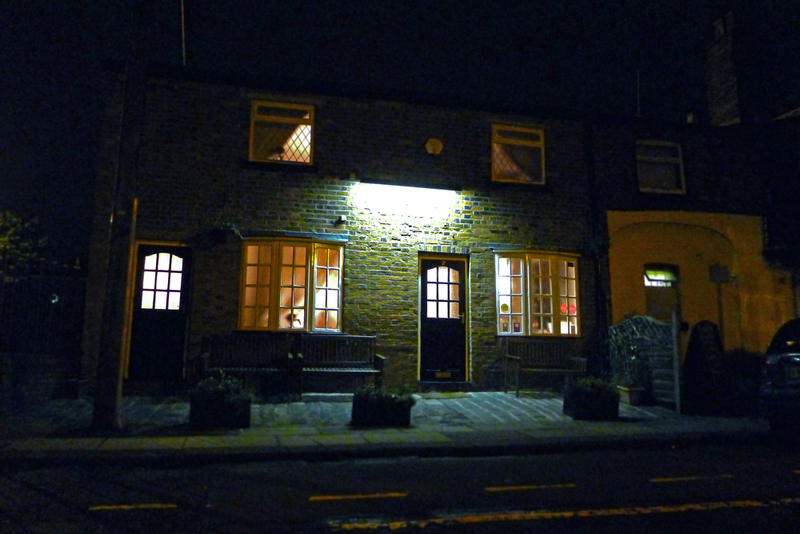 Just keep on doing what you do best , i loved it and will 100% return for more…..Oyster pud. Previous Post Restaurant “Nahm” in the Metropolitan hotel , Bangkok. 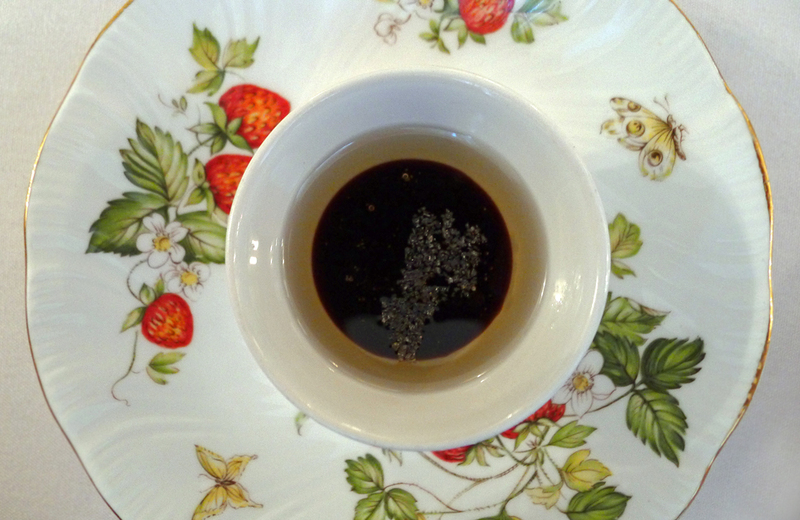 Next Post The Samling – Summer Lunch at a country house.